If for some reason you are unhappy with your purchase call us at our Toll Free Number and we will arrange for you to return your purchase for exchange or credit. Freight Prepaid by Buyer on Returns. No returns are accepted on Silkscreening Orders. 24 Teal Toy Plastic Shovels & I Dig You Stickers. Made in USA, Lead Free. 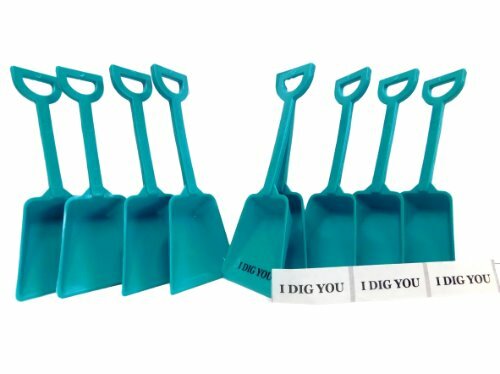 24 Teal Toy Plastic Sand Beach Shovels and 24 "I Dig You" Stickers. Brilliant in color shovels measure 7" tall x 2 3/4" across shovel. Manufactured in the USA our Shovels are Lead Free, Food Safe, Contain No BPA and are Recyclable. Questions or Requests on different quantities and colors - Toll Free 1-877-275-0052. These shovels are shown on Pinterest and are very popular for Valentine's Day and other celebrations including birthdays.